A two-component urethane primer surfacer designed to have excellent film build and fast dry-to-sand times in VOC restricted areas. It sands and feathers easily and has excellent solvent resistance, preventing ringing or lifting. 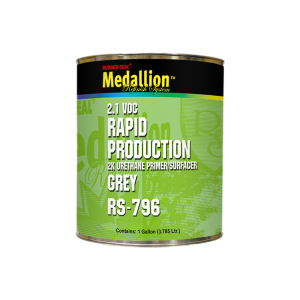 Mix it 4:1 with RS-797 activator to use as surfacer or mix 4:1:1 to use as a sealer. It can also be mixed 4:1 with RS-793 flexible activator for use on flexible parts and anti-chip areas. Available in quarts and gallons.